What software is available in the COIN-OR repository and how is it organized? What is the maturity level of a project? What is a stable version? What is a stable release? How do I obtain the source code for a COIN-OR project? 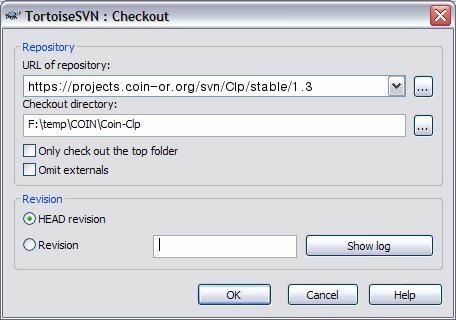 How do I use SVN to obtain the source code for a COIN-OR project? Is any of the software available as pre-compiled binaries? What is Trac and how do I use it? How do I edit a wiki page for a project? How do I compile, link, and run the COIN-OR code? What licenses are COIN-OR projects distributed under? Who do I contact for COIN-OR related questions? Where do bugs get reported? How is the COIN-OR project managed? Where does the name COIN-OR come from? Why is the web site url www.coin-or.org and not www.coin.org? I'd like to cite COIN-OR. I notice several publications, is there some standard paper that is typically cited? Q: What software is available in the COIN-OR repository and how is it organized? A: The software in the COIN-OR repository is organized into individual projects, each with its own project manager, project management Web site, project wiki, project mailing list(s), and bug tracking system. Each project is managed by a project manager who oversees development. Some of the projects are inter-dependent and others are stand-alone. For a current list of projects and links to their Web sites, please see the projects page. Q: What is the maturity level of a project? A: All COIN-OR projects are classified on a scale from 0 to 5 according the level of development of the project. The following are the descriptions of the various maturity levels. Level 0: A proposed project for which substantial development has yet to commence. Level 1: Projects that don't work yet or don't meet the requirements for becoming a Level 2 project. Level 2: Projects that build and do something useful. Level 3: Level 2 projects that also have substantial documentation, tutorials, examples codes, or other aids to enhance usability. Level 4: Level 3 projects that have versioning, a stable release (see below), and a susbtantial unit test. Level 5: Level 4 projects that are part of the [BinaryDistribution binary distribution]. Q: What is a stable version? What is a stable release? A: Project of maturity level 2 or above (see defition above) have a versioning system that ensures end users some degree of stability and a stable upgrade path as project development continues. A stable version is created whenever the project manager wishes to declare a new version of the project. Creating a stable version means roughly that the feature set and API associated with that particular version are frozen, but the code may continue to evolve through the application of patches to fix bugs, the addition of documentation, etc. Such a stable version is identified by a two-digit version number (i.e., 5.1). Stable versions continue to evolve, but this evolution should generally consist of bug fixes and minor tweaking only---development of new features is reserved for future version. 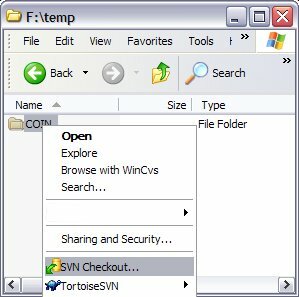 The current stable version of a project can generally only be obtained using an SVN client (see below). Q: How do I obtain the source code for a COIN-OR project? A: Source code for archived stable releases of each project are available in compressed format here. A: The source code for a project can also be obtained using COIN-OR's version control system, which is Subversion (SVN). Basic instructions for obtaining source code using SVN are avalable below. More extensive help is available here. Q: How do I use SVN to obtain the source code for a COIN-OR project? Make sure you have Subversion installed on your system. where Pkg is any of the project names on the projects page and /path/to/version is the path to the version of the code you want to download (please see the project's Web page for the appropriate path). Subversion will obtain the source for the project along with the source of any dependent projects. Install TortoiseSVN on your system. where Pkg is any of the project names on the projects page and /path/to/version is the path to the version of the code you want to download (please see the project's Web page for the appropriate path). Where Pkg is any of the project names on the projects page. Q: Is any of the software available as pre-compiled binaries? A: Yes, some packages are available in binary form here. For more information, please see the home page for the Binary Distribution Project. Q: What is Trac and how do I use it? A: Trac is the software we use for hosting the project management Web sites. It is based on a fairly intuitive Wiki, but before editing the wiki pages or submitting a trouble ticket, you must become a registered user and log in. For instructions on how to do this, please go here. Q: How do I edit a wiki page for a project? A: Before editing the wiki pages or submitting a trouble ticket, you must become a registered user and log in. For instructions on how to do this, please go here. Q: How do I compile, link, and run the COIN-OR code? Microsoft Visual Studio Project files are available for a few COIN-OR projects. See the Microsoft Visual Studio Trac page for details. Q: What licenses are COIN-OR projects distributed under? A: Most current COIN-OR projects use the Eclipse Public License and this is the license we recommend. However, we accept project licensed under any license officially approved by the Open Source Initiative. The author of the EPL is the Eclipse Foundation, and they have a EPL FAQ, based on their understanding of the EPL. Q: Who do I contact for COIN-OR related questions? Q: Where do bugs get reported? A: Go to the project's Web site (see the projects page for a list). Then become a registered user and log in following the instructions here. Finally, create a new trouble ticket. Alternatively, you may send a short email to the appropriate mailing list describing the bug. If you are uncertain which list is appropriate, see the projects page for a list or use coin-discuss@list.coin-or.org for general questions. Q: How is the COIN-OR project managed? A: The COIN-OR project is managed by the COIN-OR Foundation, Inc., a non-profit educational foundation. More details are available on the COIN-OR Foundation page. A: Glad you asked! Check out the how to help page for some ideas on getting started. Q: Where does the name COIN-OR come from? A: At its incarnation, COIN-OR was known as the "Common Optimization Interface for OR". The name (but not the acronym) was later changed to better reflect that COIN-OR is intended to host all types of OR software, not just "optimization" software. Q: Why is the web site url www.coin-or.org and not www.coin.org? A: Because there is another open source project which uses the name COIN and someone else already has the url www.coin.org. Q: I'd like to cite COIN-OR. I notice several publications, is there some standard paper that is typically cited? A: The first paper on COIN-OR that appeared in the literature was in the proceedings of CP-AI-OR 2001. A better reference is the refereed paper in the IBM Journal of Research and Development. Robin Lougee-Heimer. The Common Optimization INterface for Operations Research, IBM Journal of Research and Development,vol. 47(1):57-66, January 2003.
Corrections or suggestions for this page should be emailed to this page's maintainer: editor at coin-or.org. General questions for COIN-OR should be directed to info@coin-or.org.